Islami Tijara, India’s Premium Islamic Finance Magazine is a pioneering effort to promote Islamic Finance and Investment amongst masses through Education, Training, Advisory, Awareness and Practice. Considering there are hardly any institutions or organizations involved in providing Advisory & Training in the field of Islamic Finance & Investment in India, Islami Tijara Magazine (Hereafter referred to as Islami Tijara) has been launched to promote this innovative initiative for the noble cause. Islami Tijara is committed to the highest level of professional standards, and strives to be Respectful, Responsive, and Reliable. It is carefully designed for strict adherence to the principles of Shariah. Our research articles and analysis are reviewed, approved and overseen by Senior Shariah Scholars and Financial Experts. 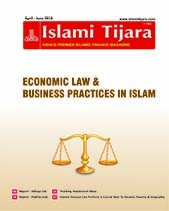 In its first year of publication, Islami Tijara succeeded to build a brand image in the market as “The only Finance Magazine in India with an Islamic Perspective”. The readership is increasing at a rapid pace and now it is well poised to deliver the Ethical, Moral and Justified messages of Islamic Finance not only to the Muslims but a also to a diversified section of Non-Muslim communities as well. With an aim to reach out to the investor community and spread education and awareness to non-English readers as well, Islami Tijara has released the Urdu Edition to cater to the needs of Urdu readers. · Islamic Indices, Shariah Compliant Stocks and Complaint Stock Rankings. · Professional courses in Islamic Finance & Investment. · Interviews of reputed personalities who have considered experts in the field of Finance, Islamic Law of Trade, Market and Industry.